What if a lyrically talented author gave readers a visceral view into how love and empathy drives activists to take great, disruptive risks? Both my thumbs are up. Okay. So now this: what if that author painted those activists into a vast and dramatic social landscape, but drew them in such broad and unapproachable strokes that only a very few readers could identify with their stories ... let alone find models, examples, or lessons applicable to readers' real worlds? 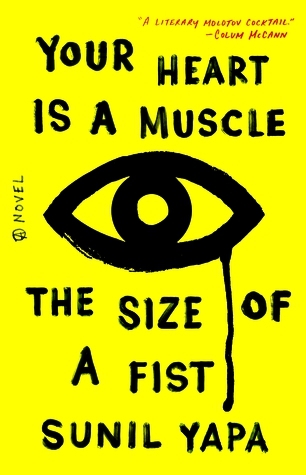 Sunil Yapa’s debut novel, Your Heart is a Muscle the Size of a Fist, is set on the afternoon of Nov 30, 1999, as confrontation peaked at the Seattle WTO protests. It’s a gorgeous, stream-of-consciousness tapestry depicting "the whole ugly beautiful thing" of an intricately interwoven globe, countless strands embodied by tens of thousands of demonstrators converging on one world-shaking afternoon at the tail end of the twentieth century. The novel's protagonist is Victor, a detached, apolitical, biracial nineteen year old with a shadily-scored stash of weed for sale. 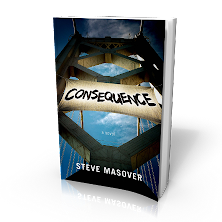 Victor has wandered the globe witnessing a web of human hurt since ditching his Seattle home and his enraged adoptive father three years before. As Yapa's tale opens Victor has returned, and sets out to look for customers among the protesters filling Seattle's downtown. Alas, none are interested in pot or even sympathetic to pot dealers. His failure to drum up business leads Victor to King (an erstwhile Earth Liberation Front arsonist who helped destroy a ski resort in Vail the year before) and John Henry (her lover, a cerebral activist with a Christlike commitment to nonviolence). Though a reader would be hard-pressed to explain why, Victor changes course dramatically, abandoning his retail ambitions and throwing down with the WTO protesters, setting the stage for confrontation with three of the book’s other principals: two beat cops and Seattle’s melancholic, befuddled, yet stubbornly authoritarian police chief. No way to undo the world where they lived in a shack made of loose boards, a family of six in a shack the size of a car on blocks, and in her life anytime she wanted she could sleep in an apartment where she turned hot water on and off and stepped from the shower and toweled dry thinking about what to eat for breakfast. How easy to slip into that life where she had a closet for her clothes and a closet for food and how easy to believe this was somehow normal. That’s what got King. Because where was the logic in the thing? The author lays out his scenes impressionistically; while he succeeds in gestalt, his prose frequently trips over itself, muddying the narrative. 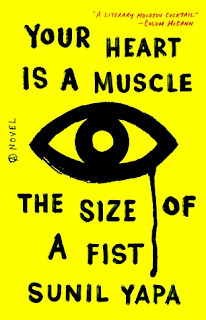 The novel’s plot is intricate and sometimes exhilarating, but it is subverted by improbably-coincidental overconstruction, and by voyeuristic immersion in out-of-control police violence. I found it hard to grit my teeth through Yapa's prolonged, cinematically sensual portrayal of police brutality that rivaled the ugliest scenes in A Clockwork Orange. Charles Wickramsinghe was surprised to feel a widening respect. A respect with more than a pinch of regret. Because how wrong had he been? To think they knew nothing. To dismiss them. All these thoughtful young people striding toward the gates of capitalism -- they had taken Gandhi’s hunger strike and arrived at this. In the end I couldn't identify with characters whose experience of and relationship with the world they inhabit is presented in fleeting, fragmented glimpses. I found Victor, King, John Henry, Bishop, Park, Ju, and Charles more credible as allegory than as individuals. It was hard to swallow that their collective history encompassed the Oklahoma City bombing, impoverished young women begging for change in India and Peru, the Rodney King riots, the ELF arson in Vail, farmworkers striking in Watsonville, Shanghai's behind-the-flash backstreets, Seattle's gay pride parade, the Tamil Tigers of Sri Lanka, 'zine culture, the writings of Che Guevara and Mumia Abu-Jamal, storefront preaching, Fort Benning's School of the Americas ... pretty much the whole globalized ball of wax. Not that it couldn't be so. But the fictional-fact that these seven characters touched all that history makes for a fistful of narrative conveniences too many. Does Sunil Yapa see and render the true, zero-degrees-of-separation relationships between everything and everyone in this interconnected century? He does. A reader stands in awe of his synthetic vision. But even as I tumbled voraciously through his pages I was disappointed to find no credible character with whom to identify, and -- especially for readers unfamiliar with the intricacies of both political economy and mass protest -- little to establish a grounded footing in the world that the novel portrays. On the other hand: just because it can't stand alone as a key to understanding the roiling conflicts of our current century does not diminish the insight and value of Your Heart is a Muscle the Size of a Fist. I’m glad to have read it, and look forward to the author's future work. An earlier version of this post was published in the Spring 2016 issue of UltraViolet, the newsletter of LAGAI - Queer Insurrection.